In Medicine's first appearance, Phantasmagoria of Flower View, she attacks the player with suzuran's poison for no apparent reason other than because they happened to be in her field. Because some of her attacks create clouds of poison in the player's side of the field which slow the player's movements and make dodging difficult she can be a very troublesome opponent to those that don't take care while near poison. Though supposedly not especially powerful or experienced among youkai, the fact that the right poison can affect even very strong people (or large numbers of people at once) makes her someone best avoided. 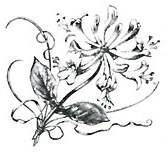 She may have been inspired by Agatha Christie, whose favourite flower was non other than the Lily of The Valley. This is backed up by ZUN's obvious love for Agatha Christie's stories as seen in other characters like Alice Margatroid, Letty Whiterock and above all Flandre Scarlet. Her name is derived from A Medicine For Melancholy by Ray Bradbury. She may have been inspired by Nathaniel Hawthorne's short story, Rappaccini's Daughter, where the title character, Dr. Rappaccini, keeps his daughter, Beatrice, confined in a garden of poisonous flowers, until she became poisonous herself. Medicine has silver-blue coloured eyes and blonde curly hair. She wears a dark red-purple shirt with red seams, a red skirt with red-purple seams, shoes in the same color and a pink bow at her back. She has a red ribbon in her hair. She is accompanied by a tiny doll that is similar to her appearance. It is sometimes assumed that "the tiny doll" might be her, who is in fact controlling the human shape beside her... The truth is yet to be seen. Although she is labeled as a youkai, Medicine's true nature may be that of a tsukumogami, as described in the Perfect Memento in Strict Sense article about the Eight Million Gods. 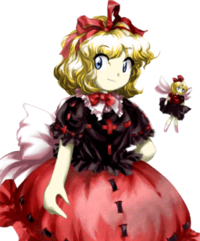 The term Konparo (コンパロ) is associated with her, due to her having said "Konparo konparo, poison gathers" in her ending in Phantasmagoria of Flower View. Konparo is an incorrectly abbreviated romanization of convalloside, a poison found in lily-of-the-valley flowers (it should have been Konbaro or Konvaro). She bears a striking resemblance to the stage 5 midboss of Mystic Square. She is associated with Alice Margatroid in fanworks for obvious reasons. Fans have given the tiny doll the name "Su-san". Though a playable character and opponent in one of the Touhou games, she tends to end up behind most Touhou Windows characters in popularity polls, and like Shizuha Aki and Minoriko Aki has become somewhat notable for her relative unpopularity. She is sometimes depicted with Yuuka Kazami in fanworks because they are both related to flowers.